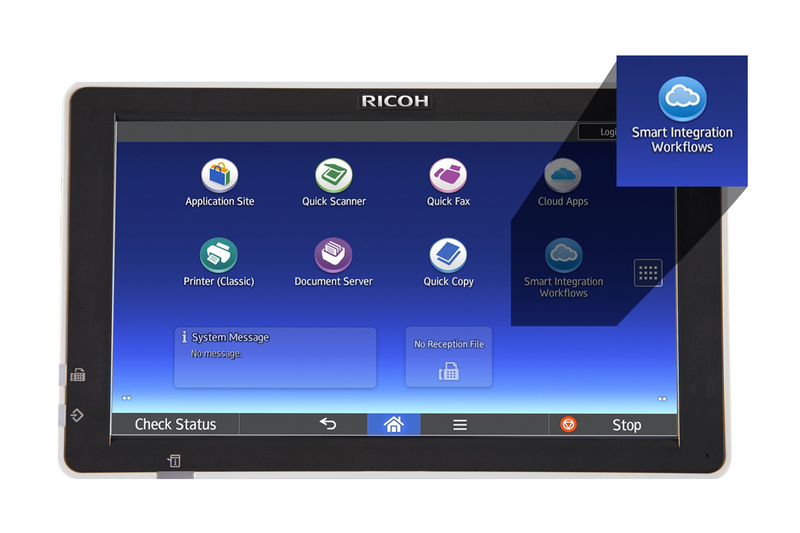 With Smart Integration Workflows and Smart Integration Advanced Workflows — part of Ricoh’s Cloud Workflow Solutions — you can automatically route information to multiple destinations in a single process. Scan to readable text with optical character recognition (OCR). Scan to and print from multiple popular cloud accounts without hassle. Gain file routing options using QR codes and automated batch processing. With Smart Integration Workflows, you can enjoy simpler scanning, routing and mobile printing. Print cover sheets with embedded QR codes to enable automatic routing. Trade labor-intensive processes for direct scanning into supported cloud accounts — including Box™, DropBox™, Google Drive™, OneDrive® for Business and SharePoint®. For advanced scanning with native integration directly to SharePoint®, choose the Smart Integration Advanced Workflow. Scan to a document library in SharePoint Online®, with metadata fields automatically populated based on information provided at the multifunction printer (MFP). Scan a stack of documents and route to a cloud application destination folder — the application will auto classify document types for you. Save time and reduce potential manual data entry errors. Smart Integration Workflows and Smart Integration Advanced Workflows also give you the ability to enhance your print processes. Eliminate the need for complex drivers and infrastructure and enjoy on-demand printing of documents stored in your cloud accounts. It's easy to print files from a cloud repository — such as Box™, Dropbox™ or Google Drive™ — by browsing and selecting files from the MFP operation panel. Because included capabilities are delivered via the cloud, there’s no complex IT needed. Get up and running fast — with no capital expenditures, onsite servers or special software to implement — and focus on the work that you do best. Automate and simplify multi-destination routing with QR codes and advanced functionality with SharePoint®. Scan directly to supported cloud accounts with OCR and enjoy on-demand printing of documents stored in cloud repositories. Receive version updates automatically — no IT involvement required. Thank you for your submission. To get started with your free trial, select Application Site on your MFP home screen, select button to initiate a trial, enter your email address and follow the prompt to install the Smart Integration Workflows icon. Then check your email to complete registration. All fields required unless marked optional.